We, the International League of Peoples’ Struggle (ILPS), join the Korean people in celebrating the 60th anniversary of the Victory Day in the Great Fatherland Liberation War against the US-led imperialist aggression. The signing of the Armistice Agreement on 27 July 1953 marked the defeat of the US scheme to conquer the whole of Korea. This agreement ceased hostilities and established the Korean Demilitarized Zone (DMZ). Since then, the termination of the agreement has long been overdue. We support the position of the Korean people and the Democratic People’s Republic of Korea (DPRK) that the agreement must be replaced by a peace treaty requiring the withdrawal of US military forces and nuclear weapons and paving the way for the peaceful reunification of Korea. We are deeply pleased with the success of the worldwide signature campaign and the march from Pyongyang to the DMZ for the reunification of Korea. We are elated that the memorial stones of the Chairperson of the International League of Peoples Struggle and the Philippines- Korea Solidarity Committee for Peace and Reunification in the Korean Peninsula are permanently placed in the wall of the Memorial Tower of the 3 Charters of the National Reunification in a solemn ceremony on Victory Day. The Armistice Agreement was designed as a transition measure to “insure a complete cessation of hostilities and of all acts of armed force in Korea until a final peaceful settlement is achieved.”But the US has perpetuated the state of war and its occupation of south Korea and has violated said agreement by introducing new weapons, especially nuclear weapons. It has used military exercises and other provocative shows of force in collaboration with the south Korean puppet regime to create a volatile situation. The US started the nuclearization of the Korean peninsula when in 1957 it unilaterally abrogated paragraph 13 (d) of the Armistice Agreement (which prohibited the introduction of atomic weapons among other weapons of mass destruction) and in 1958 proceeded to deploy in South Korea nuclear-armed Honest John missiles and 280 mm atomic cannons and in 1959 the nuclear armed Matador cruise missiles capable of reaching China and the Soviet Union then. In military exercises with the south Korean puppet regime, the US has deployed ships and planes armed with nuclear weapons. Acting in the interest of the Korean people, the Democratic People’s Republic of Korea has therefore developed its nuclear and rocket capabilities for self-defense and peaceful use and has responded strongly to the war provocations and nuclear threats by the US. A peace treaty is urgently needed to end the continuing state of war in the Korean Peninsula and to stop decisively the war provocations being made by the US in concert with Japan and the south Korean puppet regime. The war provocations and nuclear threats are being made in line with the so-called strategic shift of the US to East Asia and due to the drive of the US military-industrial complex to step up war production and superprofit-taking. The peoples and countries of East Asia and the whole world condemn the continuing malicious practice of nuclear blackmail by the US against the Korean people and the Democratic People’s Republic of Korea. Also, they deride the fact that the US does not provide nuclear umbrella to any country but in fact threatens all countries with nuclear rain. Nevertheless, the US nuclear blackmail has long been countered and rendered impotent by possession of nuclear weapons by other countries as a matter of self-defense. 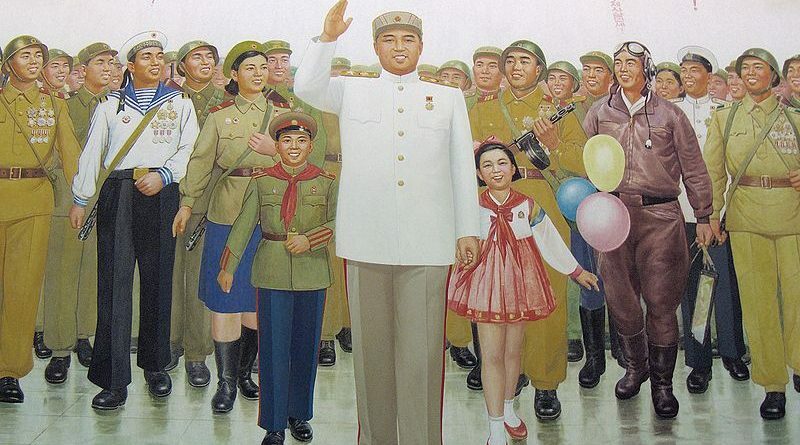 It is just for the Korean people and the Democratic People’s Republic of Korea to uphold national independence and the socialist cause and to strengthen their national defense and develop nuclear deterrence, while they seek a peace treaty to lay the ground for the immediate denuclearization of the Korean peninsula and for the peaceful reunification of Korea. An end must come to the perpetuation of the US aggressive military presence and occupation of south Korea.